Tanya Berger-Wolf is a computational ecologist. In fact, she is one of the first — and certainly one of the most well-known — computational ecologists in the young but rapidly growing field. Her core interest is in creating tools that ecologists can use to analyze data that will shed light on the social and behavioral traits of animals. 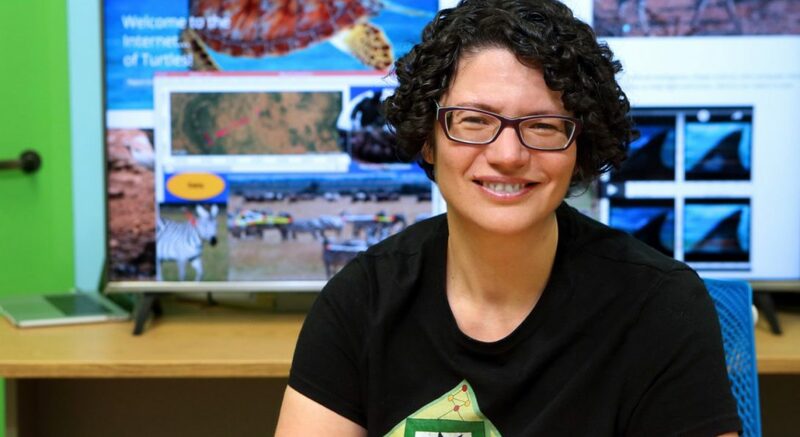 Her work has also resulted in tools that, for the first time, can help ecologists determine true population numbers of species that are endangered, and will likely help identify many more species that are on the verge of extinction, allowing for them to be listed and better-protected. Berger-Wolf, professor of computer science in the UIC College of Engineering, is perhaps best-known for developing Wildbook, a kind of Facebook for animals. “If we want to know more about the social relationships between animals, we need to know who their ‘friends’ are, so we developed Wildbook to help track which animals are spending time with which other animals, and by knowing this, we can begin to answer questions about their social structure and behavior,” Berger-Wolf said. The platform uses data derived from photographs of animals taken by tourists, scientists and camera traps and uses advanced deep learning and computer vision to identify individual animals based on coat pattern or other unique features. Wildbook helped determine the most accurate sizes of global populations of the endangered Grevy’s zebra and whale shark. Wildbook also enabled the most comprehensive study of the biology of whale sharks, helping discover the seasonality of migration patterns, among other things. Berger-Wolf said dynamic network analysis can be used to study the qualities and characteristics of leaders in groups of animals like baboons, fish or even humans. “What makes the rest of the group follow this one individual? How is group movement initiated? These are questions we can begin to now answer,” Berger-Wolf said. Her studies into leadership already have produced some interesting insights. “In baboons, it’s not always the alpha male who initiates group movement. In fact, it’s rarely the alpha male. These animals have a very democratic structure,” Berger-Wolf said. Recently, Berger-Wolf and colleagues determined that images and videos uploaded to social media channels like YouTube, Facebook and Instagram can help researchers determine accurate wildlife population counts.